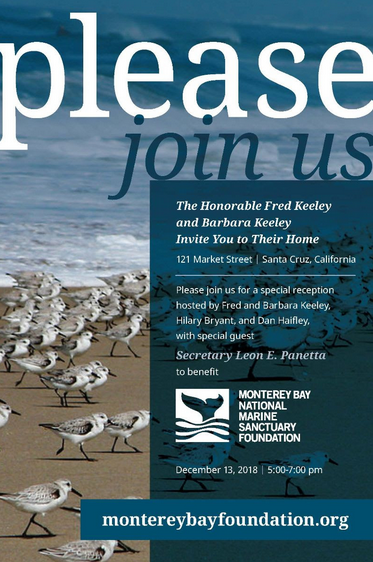 Please join us for a special reception at the home of The Honorable Fred Keeley and Mrs. Barbara Keeley on December 13 from 5:00 to 7:00 pm, to benefit Monterey Bay National Marine Sanctuary Foundation. Enjoy wine and hors d’oeuvres as you mix and mingle with fellow sanctuary supporters. Proceeds from this event fund the Foundation’s mission to inspire the public to protect Monterey Bay National Marine Sanctuary through participation in and support of sanctuary programs, projects, and partnerships. This entry was posted in Environmental, Featured, Local Loop, News, Opinion, Spotlight. Bookmark the permalink.